Baan Gerda – a model for the world: Mal angenommen, Sie haben eines der erfolgreichsten Charity-Projekte aufgebaut. Sie überlegen, es zu auszubauen und wollen Werbung machen. Was tun Sie: Eine Spendenanzeige schalten oder Leute suchen, die das Unternehmen vorantreiben? Mit der Strategie, dass Menschen mehr als Kapital bewegen würden, konnten wir auf Anhieb die INTERNATIONAL HERALD TRIBUNE (heute International New York Times) und BRAND EINS als Medienpartner gewinnen. Step 1 der Kampagne: Neugierig machen. 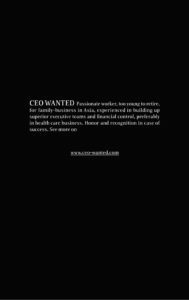 CEO WANTED: Passionate worker, too young to retire, for family business in Africa, experienced in building up superior executive teams and financial control, prefareably in health care business. Honor and recognition in case of success. Experts name Baan Gerda as one of the most promising models for AIDS orphans. That is why we’re looking for decision-makers from politics nd economy to contribute to the expansion of further projects in Africa. Baan Gerda supports you with the provision of the medical know-how, the concept of therapeutical treatment and care as well as the organisational structure of the village. Open source. 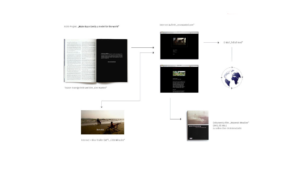 As a knowledge basis for future projects. A first impression of Baan Gerda is provided by the documentary „Heaven’s meadow“. 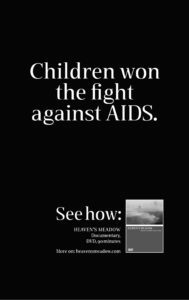 A diversified picture of the bright and dark side of children and grown ups fighting HIV. Baan Gerda – a model for the world. Step 2 der Kampagne: Glaubwürdigkeit aufbauen. Step 3 der Kampagne: Wirkung zeigen.